Coastal property is exposed. A government wave buoy off Sydney recorded the largest off-shore wave in the area since such record-keeping began, at 14.9 metres. The winds whipped up a storm surge, which encroached to near record levels in some areas, coming within metres of homes. The level of beach and dune erosion increases the risk of property damage from the next storm. Increasingly, councils and insurers will be forced to reassess the risks of further coastal development, putting values at risk. At some point governments may also take action on flood plain exposures. Properties on flood plains were literally swept away causing tragic loss of life, with images reminiscent of the Lockyer Valley tragedy in 2011. In that case the community chose to rebuild on higher ground. As the Brisbane floods showed, however, thousands of homes and businesses are built on exposed land, significantly increasing damage and disruption levels. Major cities are far from immune. Considerable surface-flooding was experienced in several parts of Sydney, with road closures and dozens of vehicle rescues. Ageing storm water infrastructure needs to be expanded significantly to cope with extreme precipitation events, a process municipalities such as Chicago, Illinois and Miami Beach, Florida have already commenced following major or repeated inundations. Disaster response, hazard reduction and recovery is a growing business opportunity. For example, disaster warning aggregator, Aeeris (AER.AX) floated on the Australian Exchange in late 2014. While its debut has been modest it is a sign of growing innovation and demand in the sector. More storms equals lower business productivity. For example, to ease the stress on the transport system the state Premier urged employers to show flexibility and allow employees to stagger their commutes or go home early. Multi-day electricity supply disruptions are also taking their toll on businesses. Global environmental shifts are disrupting business-as-usual, with a range of direct and indirect impacts. Talk to Adaptive Capability today to find out how to manage these risks and identify value creation opportunities for your business. *Note: it is not yet clear whether the particular East Coast Low conditions responsible for this week’s storm will in future lead to an increase in the frequency or severity of such events. 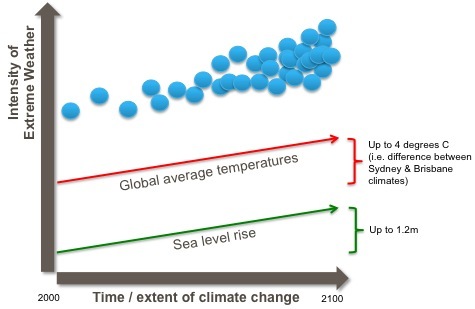 Future climate predictions exhibit a high degree of regional variation and further research is required. This link provides further discussion of some of the forecasting challenges.